As a historical glass collector, each acquisition, no matter how small, presents a unique opportunity to not only expand my knowledge of the origin and date of the piece, it also leads into a much broader expanse of education as to the inspiration of why the piece was made. It can also lead down an intriguing avenue of questions when the piece is a mystery yet to be identified. Scratching my chin and saying, ‘I don’t know,’ is just as fascinating to me as finding the answer. Featured below are some 1820’s to 1840’s cup plates that are beautiful examples of both history and mystery. 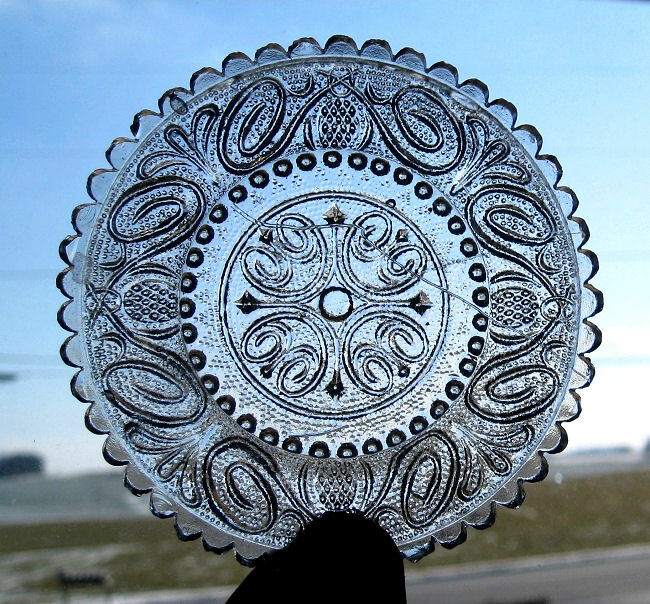 These cup plates were very popular among antique and historical glass collectors in the 1930’s, but seem to have since fallen by the wayside as collectors today consider the historical flasks and bottles to be more popular. Of course I love my historical flasks and bottles, but I think it’s about time these early American glass gems received their due. 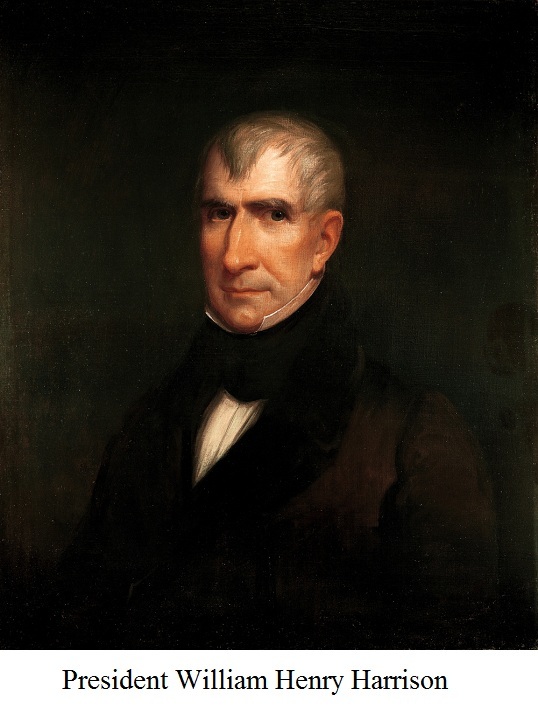 Having been elected the 9th President of the United States, William Henry Harrison served the shortest term, entering office on March 3rd 1841, and dying of pneumonia on April 4th 1841, serving as President only 30 days and 12 hours. He was, after all, 68 years old when he took office and he had caught a cold and due to the many crowds of people visiting the White House, he did not get the bedrest recommended by his doctors. During that economically depressed time in 1840, even the Jacksonian Democrats didn’t think Harrison had what it took, but the Whigs took this sneering insult and ironically, ran with it to their advantage. During that time, much like today, the attitude was that of the government being for the rich and left the common man out of politics. Not to mention that by 1840, almost 1000 banks had failed, caused by previous President Andrew Jackson’s closing of the 2nd National Bank in 1833. To the common folks, a log cabin and a barrel of hard cider looked nothing like a bank and represented the self earned comforts of a hardworking homestead. The insult from the editor turned out to be just the right theme for the Harrison winning campaign. 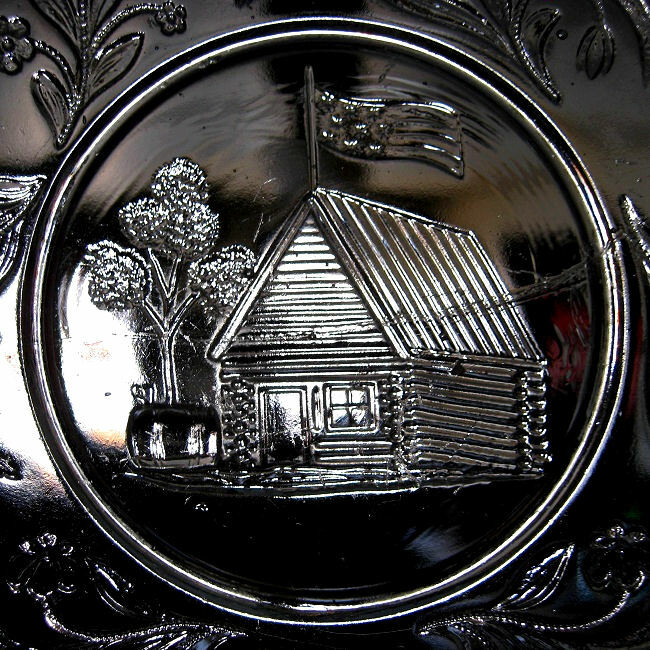 In the genre of historic glass, the slogan and theme of the cabin and cider barrel appeared on flasks and bottles at the time, (many figural and shaped as a cabin) and also on cup plates. 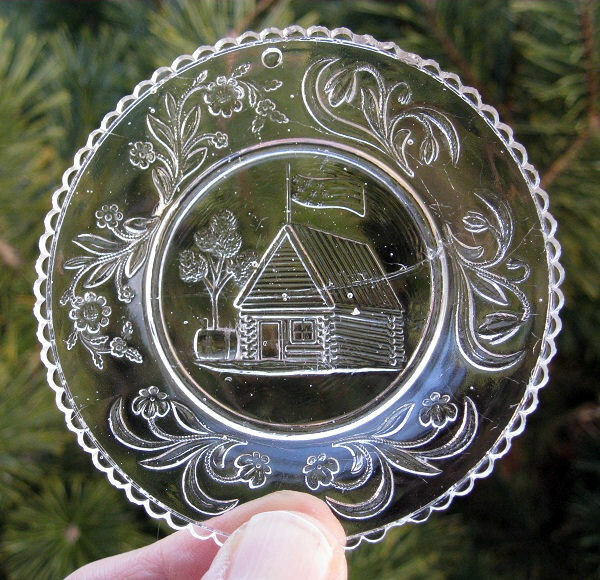 The above featured 1840 ‘Cabin and Cider’ cup plate was identified as a Boston & Sandwich Glass Company piece due to identical fragments unearthed at the original glass house site. This is as beautiful as it is a mystery. I have yet to identify it, and that only adds to the fun of acquiring these cup plates. 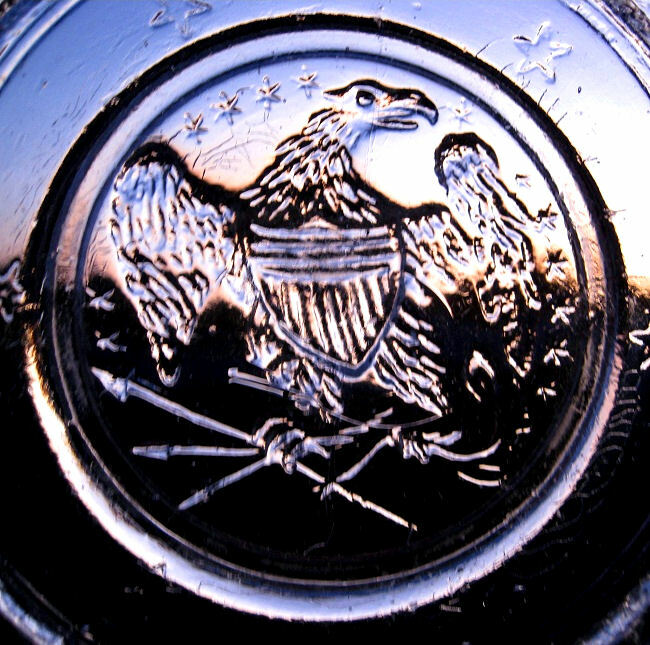 This has the fierce American eagle surrounded by thirteen stars in recognition of the original 13 Colonies. On the outer border are six stars. One could surmise that the added six stars may indicate that at the time of manufacture, America may have had only 19 States, but, in 1820 Maine had become the 23rd State. Although a mystery, this magnificent little piece of flint glass is very crudely pressed and very thick and heavy for it’s size. When tapped, most ‘crystal’ glass merely rings. 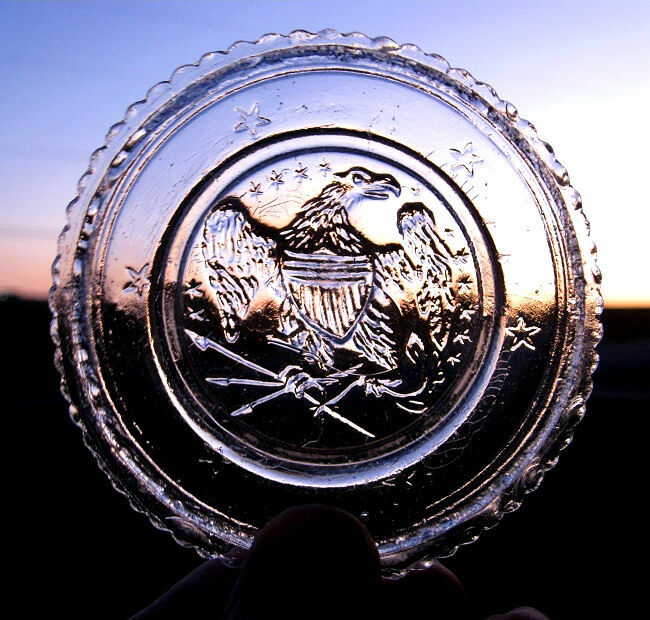 Flick this early flint cup plate and it sings. 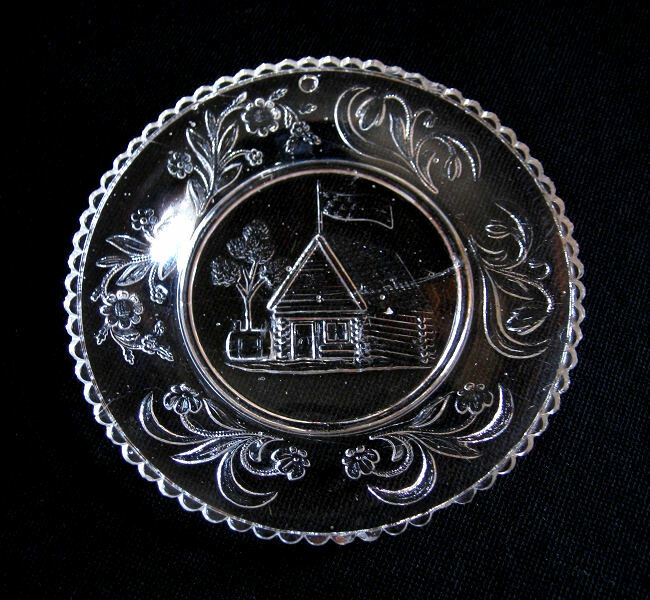 This 1841 cup plate takes one on many twists and turns in the road of it’s history and has quite a few stories to tell. 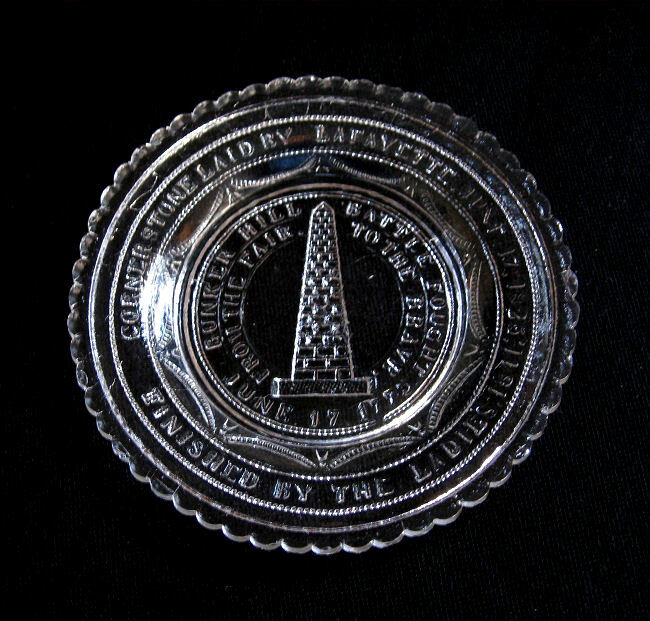 This quite historical plate is embossed on the outer border: CORNERSTONE LAID BY LAFAYETTE. JUNE 17, 1825. FINISHED BY THE LADIES 1841. 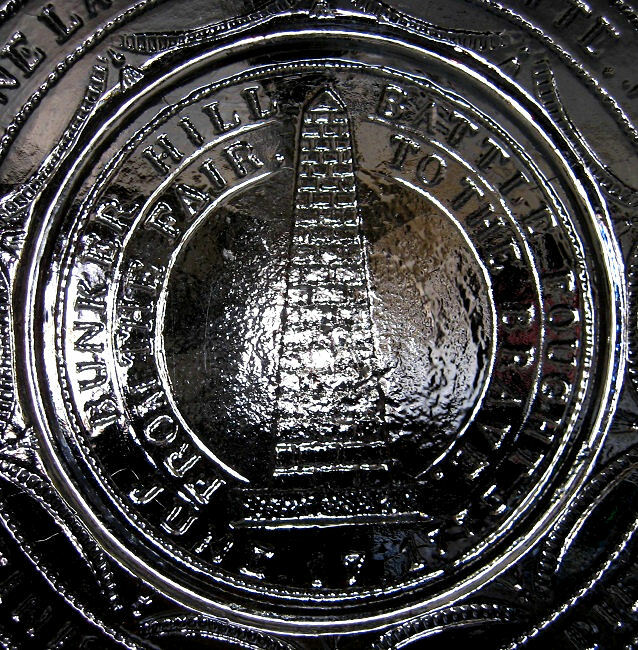 On the inner portrait it reads: BUNKER HILL BATTLE FOUGHT JUNE 17, 1775. Further inside the portrait in the center: FROM THE FAIR TO THE BRAVE. Interesting to note that the ‘E’ in ‘JUNE’ is actually incomplete and resembles a ‘T’ missing it’s top left line. 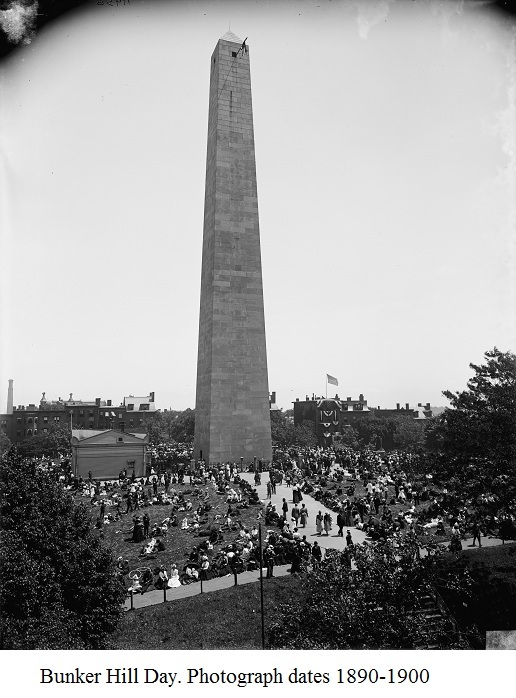 The Bunker Hill Monument commemorates the famous battle of Bunker, or ‘Breeds’ Hill, on June 17th, 1775, in which Colonial Colonel William Prescott and 1200 Colonial troops fought the British who, at the time, were occupying Boston. The battle was occurred on a peninsula known for the town of Charlestown across from Boston. The Colonial forces lost the battle, but it was not a consequential loss as you are reading this in a country that is a Representative Democracy within a Republic, with a President and not a Queen. The British may have won that battle, but their casualities were over 1000 wounded or killed, whereas the Colonials casualties were only around 450. This battle, although lost, proved that the Colonial citizen volunteers could stand up well against an organized and trained army. The Bunker Hill Monument cornerstone was laid on June 17th 1825, by The Marquis de Lafayette, who was on a 14 month tour of America. Not long after, the monument ran into financial difficulties and some of the outlying property was sold off. The people living nearest to it considered the unfinished monument to be an eyesore. 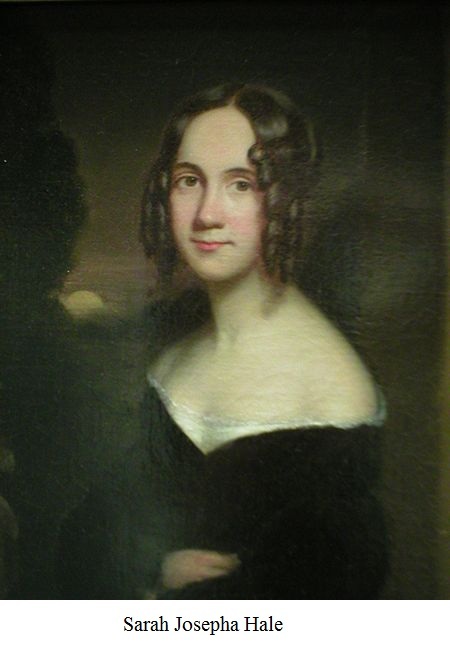 In reference to the “LADIES” who completed the monument as embossed on the cup plate, it was quite an interesting woman named Sarah Josepha Hale, a poet and author, who managed to fundraise some $30,000.00 for the completion of the monument. It was this creative and headstrong woman of the Nineteenth Century, Sarah Josepha Hale, who penned the famous poem, “Mary Had a Little Lamb,” although it was titled “Mary’s Lamb” in her book “Poems for Children,” published in 1830. She published many other books during the Nineteenth Century and lived some 90 years, having been born in 1788 and died in 1879. Most amazingly, it was this dynamic woman who had began advocating for Thanksgiving to become a national holiday in 1846. 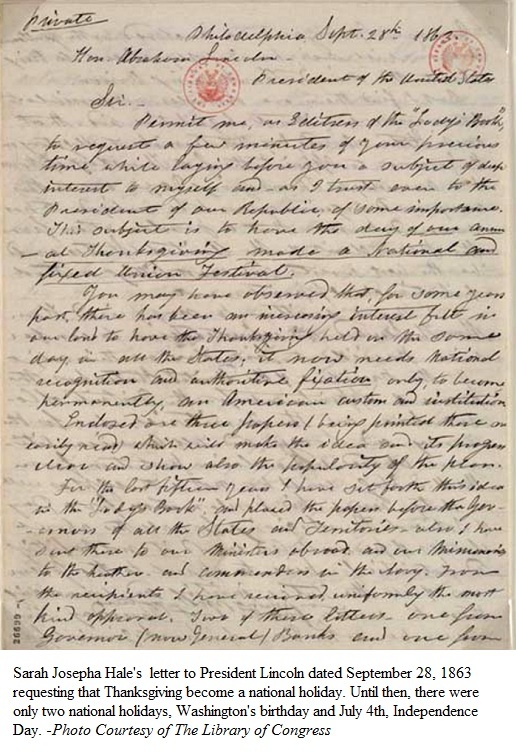 Having written letters to five consecutive Presidents; it was her letter to President Lincoln in 1863 that made Thanksgiving a recognized national holiday. It’s intriguing to me that I never learned any of this in my schooling experience. 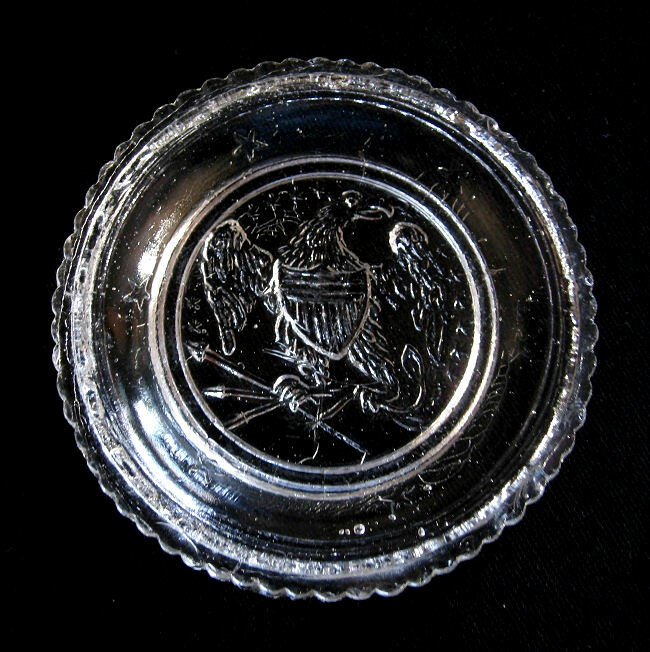 Instead, it was the acquisition of this early American glass cup plate that taught me why I have the day off to eat turkey every November and what a remarkable woman Sarah Josepha Hale was. Now I will remember her every Thanksgiving. This is not a historical, but what is referred to as a ‘conventional’ pattern or design. Like the Eagle example, I have yet to identify this as to origin and exact date of manufacture. 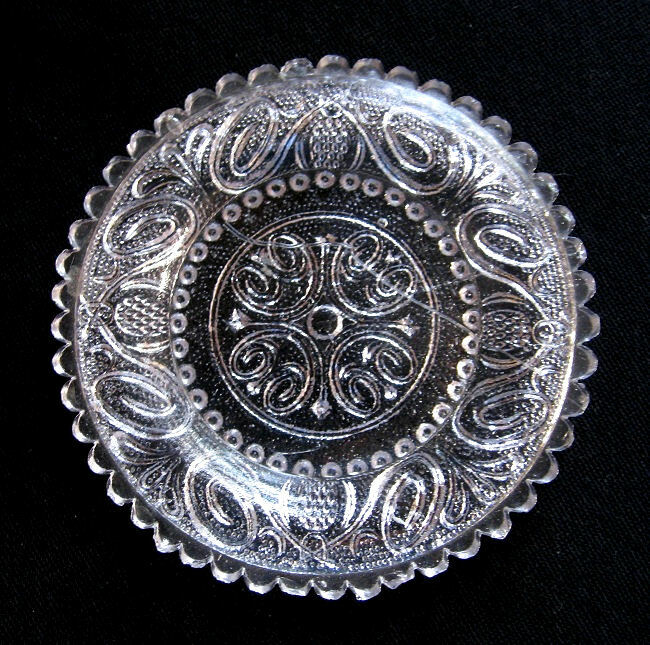 The pattern is called “Lacy” style; a very busy pattern used to hide the imperfections the early glassmakers knew would occur in it’s making. Note the wrinkle lines in the glass and the serrated edges also designed to hide chippage the makers also knew would occur with time. 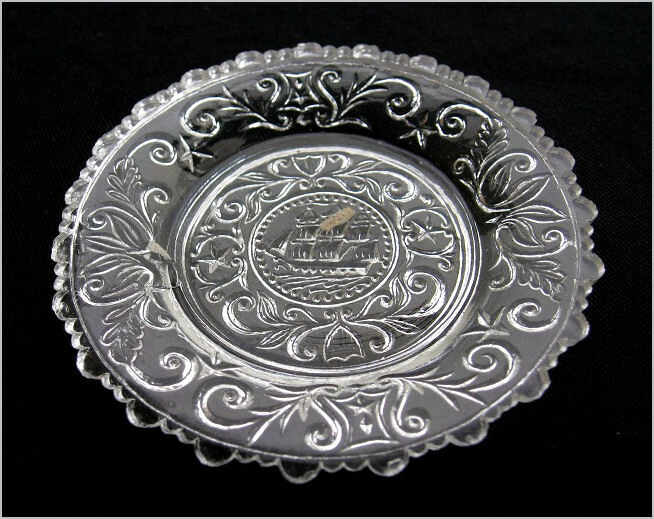 It’s possible that this cup plate could have been pressed by Boston & Sandwich, or in a Pittsburgh or Ohio, or any other midwestern area glasshouse. It’s definitely a keeper, especially after having discovered it in a stack of Pairpoint reproductions at a flea market for just a dollar. It’s definitely the real thing. Maybe in the future I’ll know exactly where this mystery real cup plate is from and the date of manufacture and the pattern name. This one started it all for me with historical cup plates. 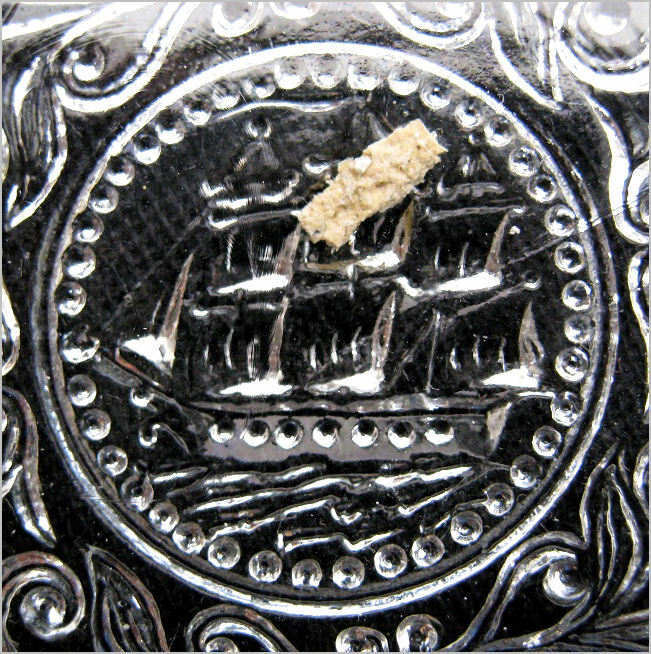 See my recent article Old Glass With Ironsides of Wood for the complete story. This was made by Boston & Sandwich to commemorate ‘Old Ironsides’ after the public outcry over the erroneous article in a Boston newspaper stating that she was to be scrapped in 1830. Note the unmelted slag or what glass workers referred to in those days as a “knot” in the middle. Very primitive and very elegant, these examples prove there are fascinating stories in other forms of early glass that cannot remain untold. These beautiful pieces represent both our heritage and history. History. It’s not just for bottle collectors.